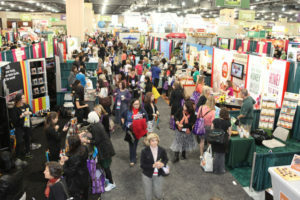 Have you been to FNCE®?! If not, you are seriously missing out on an amazing event. As a dietitian this is right up there as one of THE best conferences to attend. It can also be one of the most overwhelming conferences to attend too. Below are my tips and tricks on how to CRUSH it at FNCE® this year and every year after it! What do you want to get out of the conference besides CEU’s? Why are you going this year as opposed to any other year? I guarantee there will be no time to stop and pause once you arrive at the event, so take some time to complete the following items before you board that plane/train/car! You will hit the ground running each day. Last year I was up at 5 AM for breakfast meetings and would not make it back to my room till after 11:30 PM daily! Before you get to FNCE® pull up the session for each day and plan out what you want to go to along with what meeting you have daily. No matter how many years I go toFNCE® it usually all starts out that day one everyone is super cute and dressed up and by the last day everyone has workout clothes or super comfortable outfits and tennis shoes on in session. That being said keep in mind you represent YOUR BRAND. You might need a daytime outfit and night time outfit depending on what functions you have planned for yourself. You will be there 5 days, so that could be 10 outfits and shoes- how can you pair it down to mix and match to not over pack to save room for some SWAG! I LOVE SOCIAL MEDIA!! If you don’t know this about me oh you will, and I have made the mistake of spending the whole session Tweeting and would walk about of a session having no idea what information was shared. Self evaluation time – do you really know how to network? If so- awesome skip this section because your contacts are too full and you don’t need any more contact, social media followers, etc. If you could use a boost in your contracts or social media – learn how to really network and be intentional about it. Be kind, be you, and be curious, and know meeting new people is hard! When someone comes up to you or you jump into a conversation of strangers keep in mind those 3 little tips and talking to strangers is easier. I always like to start with where are you from? What brought you to FNCE® this year? What area of nutrition to practice in? Make the conversation about others not the ME Show. FNCE® is right up there with Disneyland for me!! It is a chance I get to see all my favorite RDN friends from around the country, make new friends, be surrounded by Lifers (like minded people who love everything I love) and totally nerd out on new nutrition information! Setting an intention and mindset for FNCE® will help to keep your mind in the right direction. What you put out there will come back to you. I can’t wait to meet everyone at FNCE®! Leave a comment below if you are going to be there so we can meet up at the Member Market Place. Also, if you want to get the full list of Tips on How to Crush it at FNCE® click HERE to get our FREE DOWNLOAD!